WTI crude prices made a comeback yesterday after a two-session slump, and they are strengthening again this morning. WTI opened at $52.37/b today, $1.56/b above yesterday’s opening price. Prices flattened overnight and are trending up again this morning. 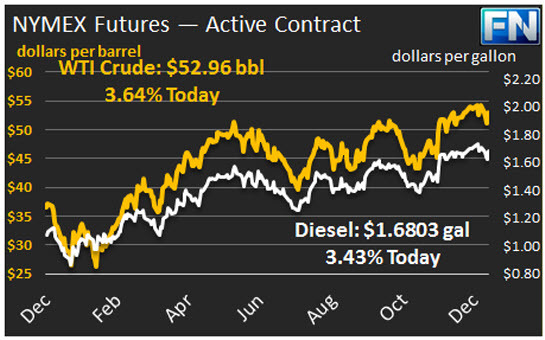 WTI prices are $52.96/b currently, $0.71 above yesterday’s close. Product prices followed a similar trend, recovering strongly, levelling off, and now rising. OPEC reassurances helped to set off the price recovery. There were reports of 5-10% cuts in Saudi Arabian crude sales to a variety of Asian refiners. Reportedly, February sales to China, Malaysia, and India, at least, are being cut. While company-specific data has not been released, Bloomberg noted two Southeast Asian refiners who had supplies cut by about 30% and one Indian refiner who had supplies cut by 20%. Having Saudi Arabia moving to cut supply counterbalanced news of expanding production in other OPEC countries. Libya is anticipating an increase in output, hoping it can reach 900 kbpd in 2017. Libyan output was 405 kbpd in 2015, according to OPEC. The EIA in its just-released Short-Term Energy Outlook has forecast higher crude prices and a continued move toward market balance in 2017. 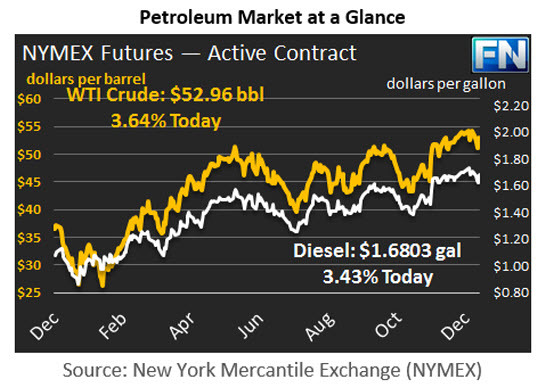 Oil prices also received a boost when the U.S. Dollar dropped after U.S. PEOTUS Trump gave his first press conference, which the markets considered chaotic and lacking in constructive direction concerning the new administration’s economic and infrastructure plans. The market is largely ignoring the massive buildup in crude and product inventories reported by EIA yesterday: 4.097 mmbbls crude, 5.023 mmbbls gasoline, and a whopping 8.356 mmbbls distillate. The bearish impact was moderated apparently by year-end vagaries concerning tax strategies and by weather issues that created a short-term jump in imports. Distillate opened at $1.6577/gallon in today’s session. This was a recovery of 4.71 cents from yesterday’s opening price. Current prices are $1.6803/gallon, an increase of 2.79 cents above yesterday’s close. RBOB opened at $1.5958/gallon today, a recovery of 3.84 cents from yesterday’s opening. RBOB prices had weakened for the last four sessions running. Yesterday’s closing price was $1.5929/gallon. RBOB prices are currently $1.6188/gallon, 2.59 cents above yesterday’s close.